Signed, lower right: ‘Luke Fildes 1896’. On reverse stencil stamp: CANVAS BOARD / FOR / OIL PAINTING / PREPARED BY / GEORGE ROWNEY & Co’. This portrait is a smaller replica of the prime version presented to the (Royal) London Hospital Medical School where the sitter was senior surgeon and the popular first president of the students’ union. The larger version was exhibited at the Royal Academy in 1896 and described thus in the catalogue: ‘Frederick Treves Esq., F.R.C.S, surgeon to the London Hospital. Presentation portrait.’ [original italics] As was common practice, a second version of the painting was produced for the sitter and his family; this one is duly signed and dated by the artist. The ‘enclosed inscription’ is that quoted above. If Treves attended Mrs Hoyle or her child, he will have done so at their home, where surgical operations on well-to-do patients were usually carried out. Extending the supposition, the Hoyles (if they were responsible for the commission) may have chosen the artist thanks to his acclaimed painting The Doctor (RA 1891, now Tate Coll., N01522), which shows a sympathetic physician at the bedside of a sick child in a poor household, representing to many viewers the ideal of a medical practitioner. Having begun his artistic career in graphic illustration, with works such as Houseless & Hungry (Graphic, 4 December 1869; later painted as Admission to a Casual Ward, 1874, RHUL), Fildes developed into a leading portraitist, who became well known for his much-reproduced portraits of Edward VII (see NPG 1691) and Queen Alexandra (see NPG 1889). In addition, both Hoyle and Fildes were from south-east Lancashire and may have had acquaintances in common. 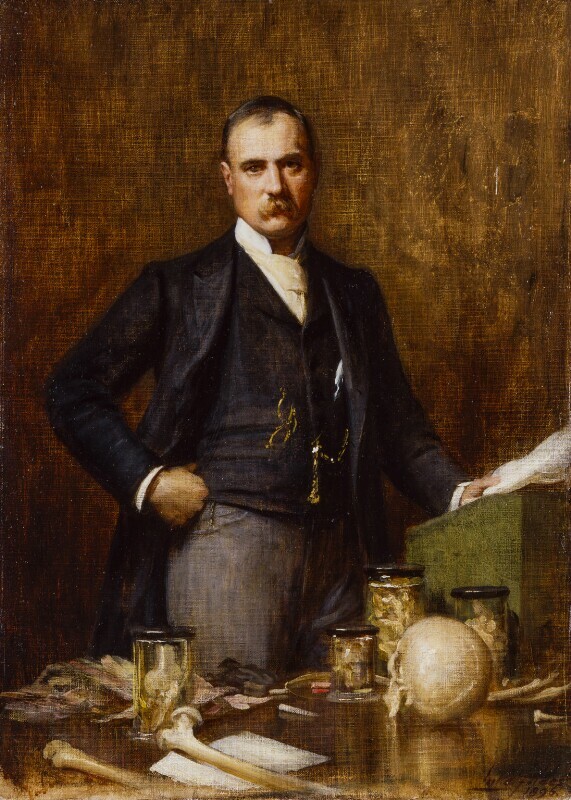 In the event, Fildes exhibited five portraits at the Royal Academy in May 1896: those of Mrs Stuart Samuel, Mrs Frank Bibby, Mrs Frank Brace and two medical men: Dr Thomas Buzzard and Frederick Treves. 1) Keith 1937; this DNB entry, published the year NPG 2917 entered the Gallery’s collection, makes only passing reference to Merrick, in relation to whom Treves’s posthumous fame dates from the 1970s and 1980s, following the Elephant Man book and later dramatizations. 2) See 3). This information was first published with the first reproduction of the portrait in the Graphic supplement of 18 Nov. 1899. 3) Isaac Hoyle to Munro Scott, warden, 1 June 1896; recorded London H. Medical College Board Minutes, Royal London H. Archives. Our thanks to archivist Richard Meunier. 4) Treves ordered all his patient case notes to be destroyed unread after his death. 5) Mrs Stuart M Samuel as Phyllida the Shepherdess, formerly with Roy Miles Ltd.
6) Letter from Luke Fildes to Henry Wood, 8 Nov. 1895, NAL (MSL/1972/6970-6972 Box 5). 7) Letter from Luke Fildes to Henry Wood, 23 Aug. 1896, NAL (MSL/1972/6970-6972 Box 5). 8) Paul Fildes, quoted in Trombley 1989, p.52. 9) Correspondence between C.K. Adams and Walters & Co., 1937, NPG RP 2917. 10) Correspondence between C.K. Adams and Midland Bank Ltd, 1944, NPG RP 2917. Three-quarter-length standing to front, fresh complexion with dark receding hair and fair moustache, wearing stiff white collar and cream-coloured Eton-knot tie, dark waistcoat and jacket, grey trousers, left hand holding papers resting on desk lectern, right hand to hip; on table in foreground an assemblage of bones including a skull, together with biological specimens in jars. The sitter, by whom bequeathed.